Gandhi accused Prime Minister Narendra Modi of being 'casteist' and 'anti-Dalit', and said his party will always stand against the BJP's 'oppressive' ideology. Congress chief Rahul Gandhi on Monday led his party on a nationwide fast targeting the Modi government but a picture of party leaders having 'chhole-bhature' before the protest gave the Bharatiya Janata Party fodder to launch a counter-attack and dub the exercise a "farce" and "joke on Dalits". Gandhi, whose party had announced the fast over a variety of issues including alleged caste and communal violence, accused Prime Minister Narendra Modi of being "anti-Dalit". 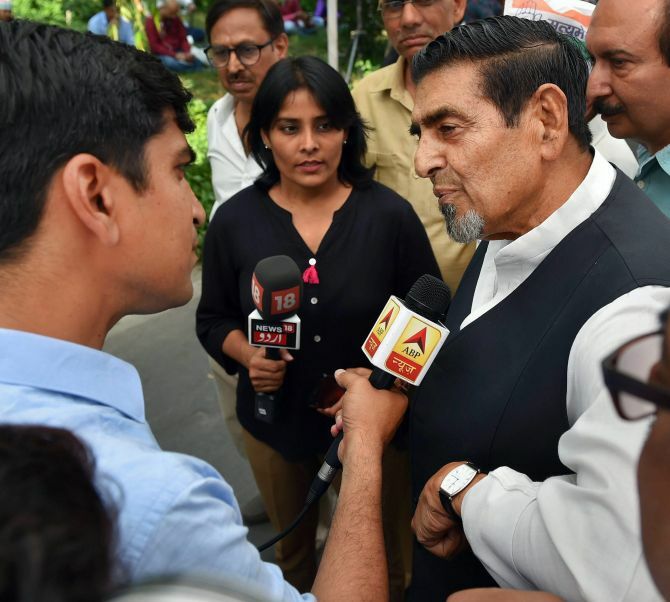 In another apparent embarrassment, the Congress had to ask anti-Sikh riots accused Sajjan Kumar and Jagdish Tytler to stay away from dais at Rajghat, where the fast was held in the national capital, which BJP spokesperson Sambit Patra described as "admission of guilt" by the opposition party. While Kumar left the venue soon after, Tytler sat in the audience along with party workers. Speaking at the Mahatma Gandhi's memorial, Rahul Gandhi launched a scathing attack on the government. "We are standing here against the BJP's oppressive ideology. We are standing here today and will stand against it all our life and we will defeat them in the 2019 elections," Gandhi told reporters. As allegations and counter-allegations flew thick and fast, Patra claimed Gandhi did not turn up at 10.30 am, when the fast began, as he was used to a "politics of luxury" and could not wake up in morning even for a day. The BJP spokesperson said Modi believed in politics of performance and has brought Dalits into economical and social mainstream with schemes like Jan Dhan and Mudra, while alleging that the Congress and Rahul Gandhi have ridiculed Mahatma Gandhi's principles of 'satyagrah' while sitting in Rajghat. Gandhi, on the other hand, said opposition leaders were being dubbed as animals -- in a reference to BJP chief Amit Shah's remarks that opposition leaders were like snakes and mongooses who flock together during floods -- but the fact is that everyone is against the government today. "The government was working against Dalits, tribals, minorities and farmers, the Congress leader said, adding the country will not accept its attempt to spread violence and hatred," he said. It is the BJP's ideology to "divide the country and crush Dalits, crush tribals and minorities", he added. He also spoke of BJP's Dalit MPs writing to Modi and claimed that the ruling party's members tell him in Parliament that Modi was "casteist" and "anti-Dalit". Hitting back, Patra said the Congress denied financial inclusion to Dalits during its long rule and its leaders cannot escape even one meal for them. It is the Congress which is anti-Dalit not Modi who economically and socially empowered them with schemes like Jan Dhan and Mudra, he said. This "politics of luxury" of the Congress, contrasted with "politics of performance" of Modi who came from a common family and hailed from a backward case and has worked to bring Dalits in mainstream socially and economically, Patra said. "This is politics of performance versus politics of luxury. You cannot wake up in morning, cannot escape even one meal but you claim of bringing a big change... You have played a joke on the poor and Dalits while sitting in Rajghat," he said. 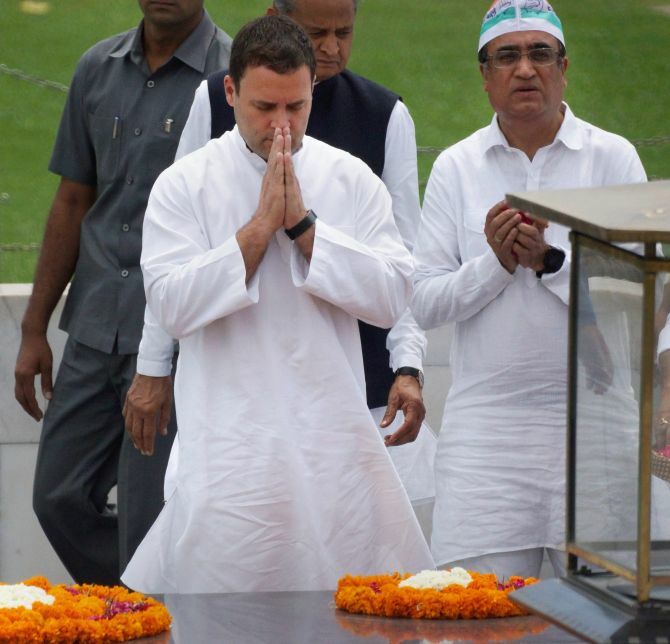 He ridiculed the Congress' nation-wide fast against the alleged caste violence and communalism, saying its leaders had come to the Mahatma Gandhi's memorial to talk about non-violence but the presence of Kumar and Tytler exposed the party's "real violent" face. "The Congress has fallen into its own trap. What we have seen from Rahul Gandhi today is not a fast but the farce of a fast," he said. Congress spokesperson Randeep Surjewala, however, said, "Some conspirators in the BJP try to find meaning in everything small or the big thing." Party leaders said the fast for harmony is also against the communal politics of the BJP and non-functioning of Parliament, where the Congress wanted to debate issues of national importance such as the Punjab National Bank scam, Central Board of Secondary Education paper leak, alleged dilution of SC/ST Act, special status to Andhra Pradesh and setting up of the Cauvery water management board. "This is a fight for the ideology and values which India represents. We won't allow the politics of hatred and division aimed at garnering votes to succeed," Surjewala told reporters. 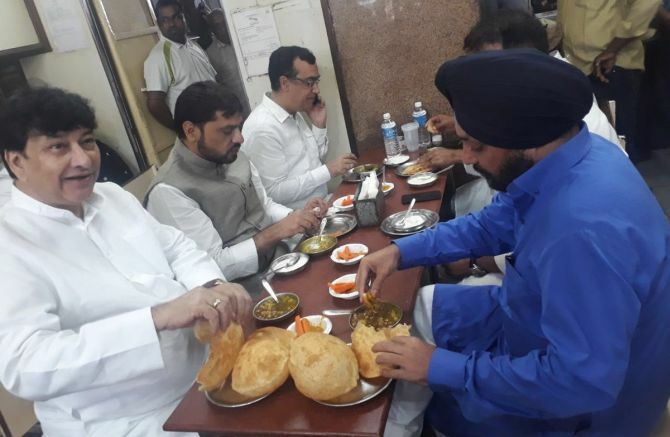 As the controversy over pre-fast food by its leaders raged, Delhi Congress leader Arvinder Singh Lovely, who was also seen in the picture, defended it and said the fast was scheduled to begin at 10:30 AM and they were busy with preparation till late night on Sunday. Alleging that the Modi government's politics of hatred and division had marred this country, he said, “Divide and rule is the policy, like the Britishers (sic), of the present BJP government. Divide the society, divide religions, divide communities, divide castes, that is the DNA of the Modi government." "We went for breakfast at around 8 am. So, there is nothing wrong in it," he said. 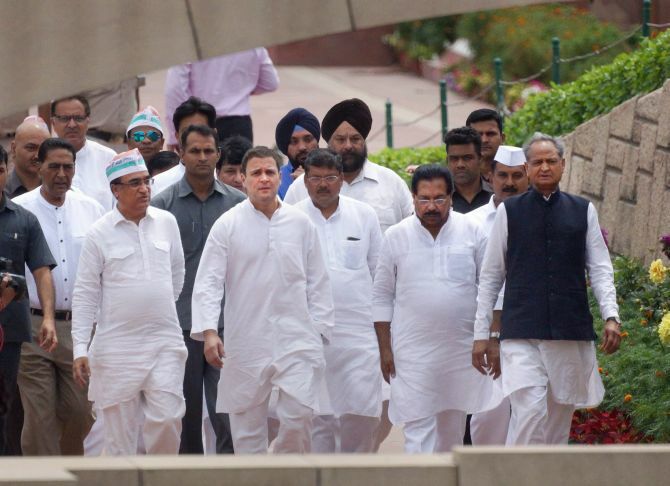 At the fast, Rahul Gandhi was joined by his colleagues Kamal Nath, Mallikarjun Kharge, Sheila Dikshit, Ashok Gehlot, Delhi Congress chief Ajay Maken and the party's communications in-charge Randeep Surjewala. Congress workers in all state and district headquarters sat on the fast, the party said.